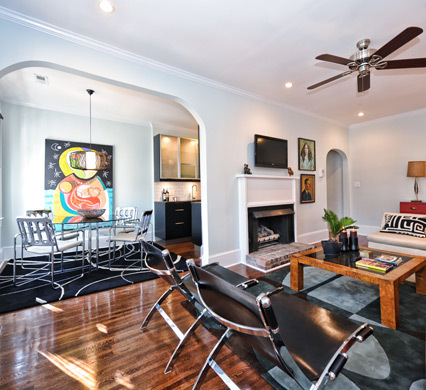 Actually this site launched awhile back, but it’s a great looking site and the owners really take care of their guests and rentals. 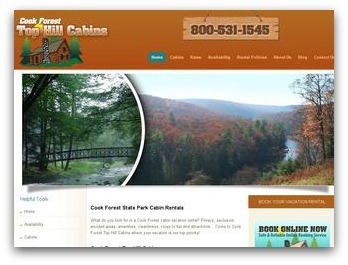 Make sure to tell Lois & Larry at TopHillCabins that you like their website next time you are looking for a vacation rental in the Cook Forest State Park in Pennsylvania! This site gave us a bit of trouble mostly because the Cook Forest is just that – a forest. Thus most of the imagery tends to be a little dark and brown. If you look at most vacation rental websites for properties in the Cook Forest, they are dark and less than inviting. We really wanted to change that and highlight the many rivers, streams, hiking trails, fall colors, etc. that dominate the Cook Forest State Park landscape. The Cook Forest has a soul, like all environments do, and so we worked hard to really bring it to the surface! For all of our web design projects, we want the website visitor to experience the true essence of the area through imagery. We’ve done that with TopHillCabins.com! Pros: There are literally too many features to list, all of which work seamlessly with each other. Some of the ones that have helped us the most: 1)autoresponding to inquiries (even automatically suggesting comparable properties when the inquiry is for a booked property) 2) building a trackable database of all inquiries and guests 3) sending emails based on specific triggers 4) alerting housekeepers to checkins and checkouts 5) Online booking--no more paypal invoices! No more paypal period!!! Literally get bookings while you sleep, click 3 buttons, and the reservation is accepted, the guest credit card is charged and a confirmation email is sent out (and the email is property specific) Money in the bank! 6) Highly customizable, from discounts, to coupon codes, to custom variables like lockbox codes 7) Simplifies all finances, accounting, tax reporting, allows analysis of your business based on occupancy rate, revenue per unit, etc. so you truly understand and can grow your business. Cons: Really none. There are ongoing improvements to every aspect of the software based on client feedback. Overall: This is the most well thought-out product I've ever purchased. It has every option you could possibly want, and has contributed to our significant growth in the few months we've been using it. The company is incredibly responsive to suggestions and customer service is top notch. It's clear they have an in-depth understanding of the needs of small- to mid-sized vacation rental businesses. They're a true partner and want you to succeed so they do, too. My advice is to buy this software from the moment you enter the vr business rather than fumbling around with different payment methods (paypal, squareup, etc), trying to keep track of inquiries, lying awake at night worried about double-bookings, forgetting to enter a reservation on your calendar and having someone show up unexpectedly, making sure you collect the balance due from guests prior to arrival, properly accounting for taxes, etc.The amount of time and effort to successfully do that without this software is overwhelming.